We had a good turn-out for the workday last Saturday, including a new volunteer named Joe Bruno. Other folks attending were Don Larsen, David Miller, John Bush and his son Johnny, Terry Bledsoe, Ted Dawson, Chili Ornelas, Leonard Garcia, Ron Marcotte, Tom Gaylord, Al Sumrall, Gary Goolsby, Mike McCormick and Derek Staha. John and Johnny Bush went to work on the Model Ts and they’d have to tell us what all they got accomplished. All I saw were a bunch of batteries being charged up. I don’t recall seeing any of the Model Ts running around the place so it is possible they were unsuccessful in getting any of them to run! While Al was present, I don’t recall seeing him around much, so I’m not sure if his presence was a ‘drive-by’ or whether he was hunkered down in the vehicle hanger all day! Terry Bledsoe tackled attic clean-up. First he had to repair two fruit crates, then he set to collecting Ranger engine parts from the attic and putting them into the crates. Portions of the attic got swept and some of the parts were removed to the storage hanger. 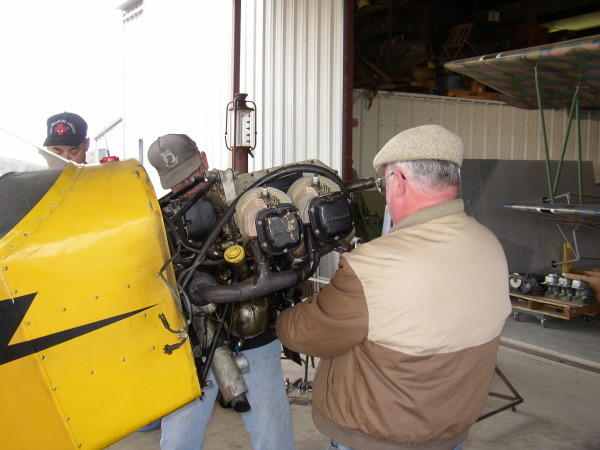 Mike McCormick, Ted Dawson, and Dave Miller started the process of changing the engine on the Piper Cub, working under Roger’s direction. The change was dictated by the fact that the old engine was making some bad news sounds, similar to rod-knock! They succeeded in getting the old engine off and installing the spare but there is a long way to go before they’ll be able to fire it up. The spare engine apparently has some minor issues of its own that cropped up on the re-installation… something about a spark plug seat. They did get the new engine hung and re-assembly started of the ancillaries. Last I saw they were working on solving a ‘chinese puzzle’ called the engine baffles! Roger had hoped to start covering the Thomas-Morse ailerons and get them doped and rib stitched as the envelopes for those are sewn. But the ailerons were not completely varnished. 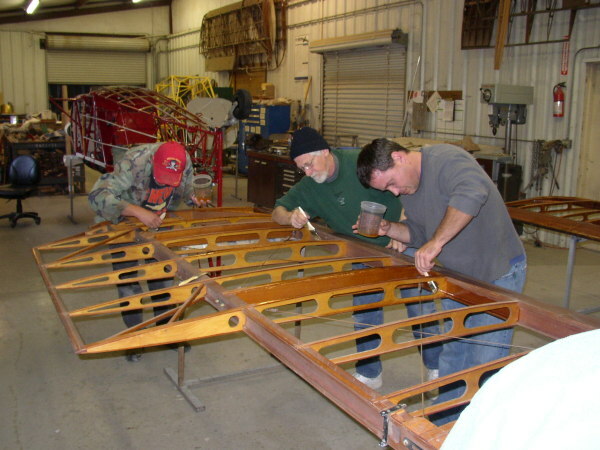 Leonard, Ron, Don, Chili, and Gary brought out two wing panels from storage – one T2 upper wing panel and one T1 lower wing panel. These two panels were wiped down and blown off to remove as much surface dirt as possible. The aileron was removed from the upper wing panel and it was discovered that it required some serious repair. Several guys epoxied that back together and set it aside to dry (due to the weather conditions everything took forever to dry!). All remaining fittings were stripped from the wings and stored in a blue drawer in the back shop. Roger directed the team to square the T2 upper wing panel. T2 has never been flown and the turnbuckles were not safety wired, so Roger felt that squaring the panel was good preventive medicine! The team got the wing squared and safety wired the turnbuckles in place. Once the wings were prepared, space was set up in the back shop and the wings and ailerons were epoxy varnished. Due to the slow drying time only the top sides of the wings were varnished. We made a conscious decision to get the last T1 wing panel in process as everything else we’ve done regarding wing panels is T1. That way the entire wing set can be on the cradle and we can keep them together. Roger mentioned in passing he needs to locate another aileron actuation arm as one of the units sent to the powder-coaters proved to be mostly rust!